I was going to be better this month. Post a few favorites during the month, rather than waiting until the end of month wrap-up and then marching through them all. But of course I wasn’t. Earlier in the month I thought about featuring this little Melianthus villosus. It was a gift from Evan, The Practical Plant Geek. When he originally asked if I would be interested in one of his seed grown plants I said thank you, but no. I didn’t know where I would put it (yes, I really did, crazy right?). Annie's Annuals says: "Everyone loves Melianthus major until -oops - it gets, like, 12’ tall x 10’ feet wide! Melianthus villosus has a much more realistic size for the average garden, quickly growing to 3’ - 5’ tall x 3’ wide. M. villosus is hardier, too, returning from the roots when it drops down to 10 - 15 °F The large, serrated, tropical-looking, blue-green leaves are invaluable for providing beautiful, evergreen foliage in the garden." Funny thing, when I look at the photo below I see it's surrounded by a Ginkgo from The Outlaw Gardener, Ajuga 'Black Scallop' from Bonney Lassie, and Moluccella laevis (Bells of Ireland) seedlings from Amy Campion. Have I got the best gardening friends or what? The next plant I meant to write about was this Podocarpus matudae. I've "fav'd" it before, when it was new to my garden. This one was also a gift, from Sean Hogan. It's slowly becoming a hint of the giant (20 ft tall) it might one day be. Cistus Nursery says: "From 5200 ft in the Sierra Madre Orientale cloud forest, our collection of this lovely and rare Mexican podocarp, one of the most beautiful hardy conifers for tropical effect. To 20 ft tall or so with weeping branches and a graceful form -- a large textured presence in the garden. Damp soil and dappled shade is best with protection from drying winds. Has tolerated temperatures below 10F, upper USDA zone 7, so far." And the new growth still makes me think of a fake plant. It's just that bright and unreal. Finally, while moving containers around on the patio this Agave xylonacantha was a standout, with its captivating blue color. It was a purchase last September from Flora Grubb in San Francisco. An image search tells me the extreme blue isn't common to the species. Perhaps I got a rarity? Anyone with experience care to chime in? San Marcos Growers says; "Agave xylonocantha (Saw Leaf agave) Single or occasionally clumping plant with open rosettes to 3 feet tall by 4 feet wide with only a sparse number of pale grey-green lanceolate leaves with a lighter center stripe and broad light-colored almost papery irregularly-shaped spines on broad teats that run together along the leaf margin. Plant in full sun. Hardy to the low to mid 20's°F. This close relative of Agave lophantha comes from the drier limestone slopes and valleys on the desert side of the Sierra Madre Oriental..."
This blog post is my end-of-moth wrap up of favorites, plants that stood out in my garden, for the month of May. If you're a Blogger please share links to your favorites for the month in the comments. If you're not a Blogger then please tell us about what plants are performing extra well in your garden this month. We want to know! All material © 2009-2015 by Loree Bohl for danger garden. Unauthorized reproduction prohibited and just plain rude. I've been here before, but this is the summeriest I've ever seen it. This patch of Artemisia ludoviciana 'Valerie Finnis' reminded me that mine, at that time, was MIA. Since then it has started to return, although it's not nearly as grand as this. Increasing shade has taken its toll and my Euphorbia griffithii ‘Fireglow’ didn't bloom this year. I guess better start scouting for places to move it. Seeing these rocks, under the Spokane sun, takes me back to the area that I grew up. Dry piles of basalt. Definitely not the "lush green" many people picture when they think of Washington state! And there's always room for a Verbascum. Another one of those well placed empty containers. I really need to give my Rodgersia more room to spread. First I must go to the greenhouse at the end, and work my way back. Labeled as Agave schottii, but with a question mark. For me the appeal of a Hosta is in it's big leaves, I don't understand the thin leaved ones like this H. 'Praying Hands'. Oenothera longifolia 'Lemon Sunset' concludes our visit (and yes, I left without buying a thing!). 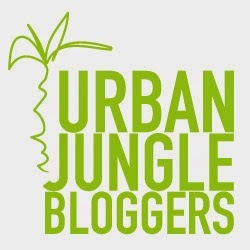 As with many things one discovers on the internet I can't quite remember how I stumbled upon the Urban Jungle Bloggers. The founders (Igor and Judith) say: "We are bloggers, we are friends and we love greens in interiors and around us. Our mutual passion for plants has resulted in our project called Urban Jungle Bloggers"...(UJB) is all about living with plants – in your home, in other interiors, in public spaces. We want to highlight the beauty and benefits of houseplants and other greeneries in urban spaces. Living with plants is not merely about styling and decorating. Houseplants have beneficial effects on our living environment and make our lives better, healthier and more beautiful. It is our mission here on Urban Jungle Bloggers to share this love for plants with other like-minded bloggers"
If you sign up to be an Urban Jungle Blogger you get a monthly newsletter with their selected topic (this month = #plantgang). You then create a blog post on that topic and link to them, they'll link to you and all that standard fun internet meme business. They also encourage you to get creative and add your own personal touch. Which I'm doing since I am not posting about houseplants but rather my patio plants. I had just finished "styling" (their word and it works - I like it better than "arranging") my containers for the beginning of patio season and remembered their topic for May is "Show your Plant Gang" - so I am! This group feels a little awkward. The huge Grevillea 'Peaches and Cream' looms large over everything else. Once all those buds open though, well, it will be the star. Agave lophantha 'Splendida' gets the funnel treatment this year. Please ignore the empty pond tank. It's been growing ugly red algae and was undergoing a clean when I shot these photos. Which is why this group is pathetically bunched away from the wall, I'm giving myself room to work before I place them. This group didn't photograph well, it's better in person! And this one too. I need to do a little more styling before I can feel 100% about it. Buying something to go in the large orange container at the back will help. Finally, the driveway veggie garden, sort of. The tank on the right is full of the Agaves (and other succulents) that will be going in the ground, the tank on the left is really pushing out sugar snap peas but soon I'll be ripping those out and planting tomatoes (tomatoes and basil = summer!). Did I commit Cotinus murder? Rare Plant Research Open House, a decade of fun! What the #@&*? But that's not possible!